44" X 56" X 50"
I explore the conceptual and formal relationship between human and automotive adornment through formulating a hybrid device in "Universal." 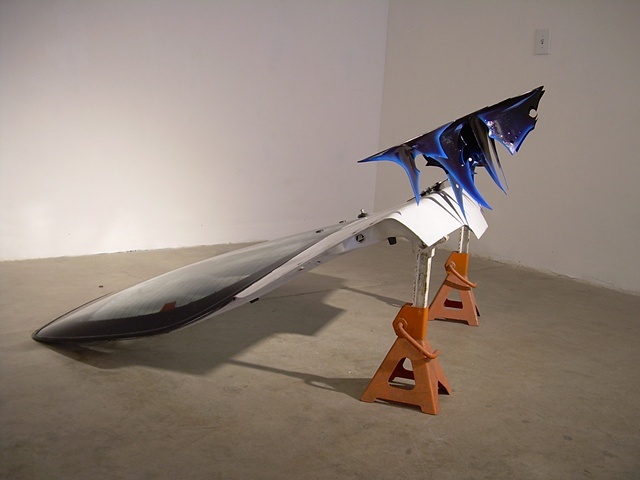 Made with steel fabrication, body filler, and automotive enamel, this piece is a mountable spoiler constructed as a three-dimensional projection of a lower back, or 'tramp stamp' tattoo design. The tattoo thus becomes an autonomous element. The stylization of the automotive and tattoo elements reference the historical and theoretical doctrines of ornamentation as nefarious, as well as the universality of adornment as a cultural product. However, in the automotive industry, 'universal' no longer indicates that an accessory is compatible with any vehicle, but has rather become synonymous with cheap and after-market. The sparkly blue paint accenting this piece is ubiquitous of cheap after-market automotive paint jobs available at establishments such as Earl Scheib or Maaco. In fact, this color of blue is called "universal blue" at Maaco.